It’s August and that means one thing here at Fete & Feast: it’s Hatch Chile Month! Over the last several years Hatch Chiles have become something of a celebrated vegetable here in Central Texas. Given my roots in far West Texas just down the road from Hatch, New Mexico, this thrills me to no end. Last year I celebrated Hatch with the likes of macaroni and cheese, enchiladas, green chile cheese beer bread, and green chile palmiers. This year I’m cooking up cornbread, roast chicken thighs, and even grilled cheese, all featuring the little green chile that could. To kick the season off I’ve put together this recipe for a hand pie stuffed with squash, green chile, tomatoes, and cheese. It’s a fun take on calabacitas, a traditional way to cook squash with onions and green chiles that was featured at my family’s dinner table many a summer when squash were in abundance. I’ve tucked the squash, chile, and cheese mixture into puff pastry to make it convenient finger food, just perfect for a party. You can make these little bites ahead of time and freeze them unbaked so you have a quick meal or appetizer any time you get a hankerin’ for a taste of Hatch. The filling in these empanadas is so substantial they will hold up nicely as a main dish. Serve them with a side of guacamole and a green salad for an effortless Meatless Monday menu. 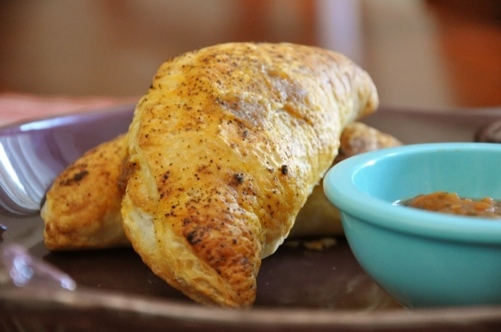 These pastry pockets filled with summer vegetables and spicy seasonings are hearty enough to be a main dish. They are perfect for Meatless Monday. Heat the olive oil in a sauté pan over medium heat until it shimmers. Add the onion and sauté until it begins to soften, about 3 minutes. Add the shallots and sauté until they begin to soften, about another 2 minutes. Add the squash, salt, and pepper, and sauté until the squash begins to soften, about 5 minutes. Add the chiles, tomato, cumin, oregano, and chile powder. Stir to combine. Transfer the mixture to a medium bowl and pop inter freezer for 10 minutes to chill or refrigerate for up to 2 hours. After the mixture is cool stir in the cheese. Whisk the egg white and water together for an egg wash.
Dust your counter with a little flour and roll one sheet of the puff pastry to a 10″ x 16″ rectangle. Use a 5″ cookie cutter to cut 6 rounds from the puff pastry. Repeat with the second sheet of puff pastry so you have 12 rounds in all. Brush the outer 1/4″ of a puffy pastry circle with the egg wash. Place a heaping tablespoon of the filling onto one side of the pastry round. Bring the other side over the filling to create a half-moon shape and press the egg washed edges together. Crimp with a fork to form a tight seal. Cut three small venting slits in the top of the pastry with a sharp knife. Repeat with the remaining 11 circles and filling. Place all of the filled pastries on the baking sheet and brush the tops with a little more of the egg wash.
Bake for 150-20 minutes or until the pastry is nicely browned. I use a 1 Tbsp. scoop to make filling the pastries equally easy. A standard tablespoon will work as well. You can prep the empanadas ahead of time and freeze them unbaked to bake later. Follow all of the steps up to brushing the top of the finish pastries with egg whites. Place the pastries on a baking sheet and freeze. Transfer the frozen pastries to a ziptop bag for storage up to 3 months. When you’re ready to bake the empanadas, place frozen pastries on a baking pan, brush with egg wash, and bake for 5 minutes longer than you would if the empanadas were thawed. Sour cream and guacamole are great for schmearing on these lovely pastries. You can use a smaller cookie cutter to make smaller pastries. Reduce your filling accordingly. You don’t want the filling to overflow the pastry while it cooks. I like puff pastry for this recipe because its one less thing I have to make, but if you prefer traditional empanada dough or even prepared pie dough both will will work as well. Generally I do not read article on blogs, however I would like to say that this write-up very forced me to try and do so! Your writing taste has been amazed me. Thank you, very nice post. I note there are plenty of spam on this wordpress bog. Will you be planning to clean it up. Might Be I can really help to carry through? related topic, your site came up, it looks great. proceed this in future. Lots of folks will probably be benefited from your writing. Olympic events, however remains to be the home of several competitions and mugs.